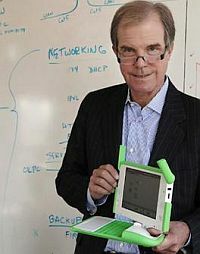 Ever since Nicholas Negroponte started announcing that OLPC would parachute XOs into remote villages many people have asked whether he could possibly be serious about this. It seems like we now have an answer thanks to an interview he did with New Scientist (registration required to access the full article, at the moment the full text is also available here). A pre-pilot will start on 1 January 2012. Pre-pilot means that it will be small and there will be modest human intervention just to see children's reactions in order to better design the real, hands-off, dropping-out-of-the-sky format. He continues to explain that for this pre-pilot villages in Sierra Leone, Tanzania, and Liberia are being considered on top of a project that will take place in India. In terms of the hardware it's not quite clear which version of the XO OLPC will use though there is a reference to "tablet computers" in the article's introduction. As such I'm guessing that sooner rather than later prototypes of the XO-3 tablet will find their way into these pilot project. As these villages will be off-the-grid Negroponte also mentions power being provided by solar panels and hand cranks. Since the software is really centred on early childhood and immersive for that stage of life, they may be too babyish for older kids. Negroponte also said that Sugata Mitra, whose work is most widely known as the Hole in the Wall experiments, is involved with these pilot efforts. If you haven't heard of Sugata Mitra or Hole in the Wall then my one sentence summary of his line of research would be that it's very much about children's self-learning abilities. So he's definitely a great addition to such a project. But I am really going into this with an open mind. It is an experiment, and one outcome could be "no, they cannot". Needless to say despite my skepticism about such a deployment model I'm looking forward to learning more about these pre-pilot efforts once they gets started in three short weeks from now. I could imagine OLPC using the CES IT tradeshow taking place in Las Vegas between January 10 and 13 to make further announcements in this area. Huh, a "pre-pilot", eh? And to think that Negroponte once said "To do a pilot project is ridiculous!"